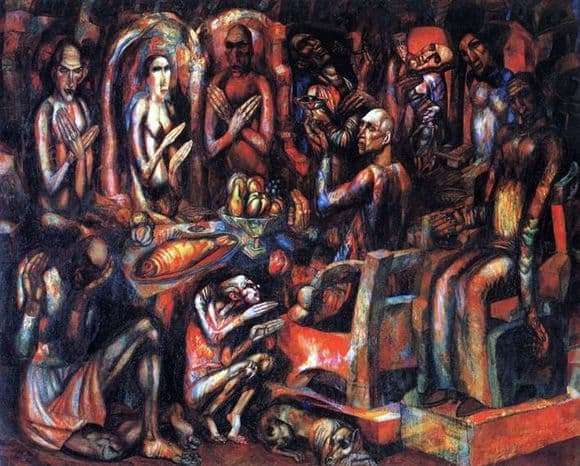 The painting “Feast of Kings” was painted by Filonov in 1913. It must be said, the first glance at it leaves not the most pleasant impression: the contrasting red and black tones, the ugly elongated faces and the figures that crowd around the picture, are not at all appetizing dishes on the table. The characters in the picture gathered around the set table do not evoke sympathy; they rather resemble decaying corpses than people and, especially, kings. The power in this picture is an ugly, disgusting phenomenon. The plot seems to be built around a certain holiday that brought them all together, but the mood here is absolutely not festive. Looking at the picture, you feel cold and silent, the hands of the characters are folded on the chest, like those of the dead. The eyes of many of those present are covered, and those that are open, exude cold and indifference. Red tones evoke quite natural associations – blood, aggression, horror, and contrasting black adds a sense of gloom and oppressive atmosphere. It is not clear what is poured in the glasses of these people: maybe this is wine, and maybe blood. It also catches the eye that not all the people depicted in the picture are men. One of them is a woman, written in slightly lighter colors than the rest. It may seem that it personifies a bright beginning, some glimpse in the darkness. However, on closer examination it becomes clear that this is a deceptive impression: her face is ugly, she is naked and she seems to have no hair. Rather, it personifies vice than light. Associations with The Last Supper involuntarily arise, only the Feast of Kings is like a dark version of this famous painting. Moreover, in the picture there is a dog curled up under the table. It may seem that this is just a harmless animal, but in reality, the dog is a symbol of a devilish, dark beginning.